BACKORDERED ITEM: THIS ITEM IS ON BACKORDER FOR ALL SIZES FOR 4-8 WEEKS. BELLEVILLE IS ONLY FILLING QUEUED BACKORDERS AT THIS TIME. THIS ITEM WILL NOT BE OPENLY AVAILABLE FOR THE NEXT FEW MONTHS. NEW ORDERS WILL BE PLACED IN BELLEVILLE'S BACKORDER QUEUE AND SHIPPED IN 4-8 WEEKS. The Belleville C300 ST Men's Hot Weather Steel Toe OCP ACU Coyote Brown Boot was designed to meet the harsh demands of the U.S. military. This boot features 100% full grain cowhide leather and nylon for toughness and breathability. A steel toe protects your feet at all times for occupations with falling hazards. The outsole is provided by Vibram and is made of 100% rubber to ensure superior traction in urban and outdoor environments. 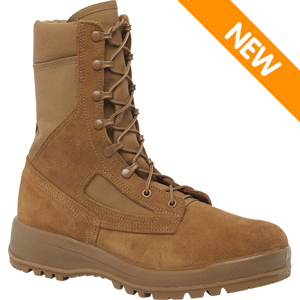 This boot is proudly made in the USA and meets all military standards for AR-670-1 uniform wear. I bought these on the recommendation of a friend. I originally got these for hiking on the weekends because of the durability and ankle support. But I found myself wearing these all the time. They're very comfortable. It's true that they do feel like running shoes. The soles are very cushioning. Also, my feet don't sweat in these boots like the older all leather Cat boots I used to wear. These Belleville boots so comfortable on my husbands aching feet. I do my husbands clothing shopping and he asked me to find him a pair of work boots. I read reviews online and bought these. Great Choice. He is very happy with these boots. Says they are very comfortable and allows his feet to breathe in the hot summers here. Belleville has improved this boot compared to the previous generation I first got several years ago. I can't remember the model but it was a hot weather desert boot. This version (300 DES ST) has an tougher fabric upper, which doesn't rip as easy. Leather quality seems to be better as well, at least thicker. Also, the boots are well made just like the previous generation. This is what I would expect in an American made boot. They're still using the quality Vibram soles and speed lace eyelets so that hasn't changed. It does take a few days to break in these boots but that's to be expected with any type of footwear. The factory insoles leave something to be desired. They are made of a flimsy foam material. They do add cushioning but very little support. If you are planning to do a lot of walking. The good part is they're easily removable so you can upgrade to better insoles at anytime. Even with this minor drawback I still give this boot an overall 5 star rating. I bought these boots per recommendation of some of the guys in my Army unit. I've worn Bates, Wellcos, and Rockys in the past so I've tried a lot of different boots. My latest pair are the Rockys which are comfortable but they don't seem to stand up to everyday use (I've had them for a year and a half). So far the Bellevilles have been good. I've only had them for 3 months but the sole feels pretty solid and the tread is barely starting to get rounded on the edges so these should last a long time at this rate. The only minor thing is theyre not waterproof but when I bought them, they were classified as hot weather boots. I just bought my third pair of Bellevilles. The 300 is really made for the hot desert. The unlined upper keeps your legs and feet about as cool as allowable and I'm really glad these boots have a gusseted tongue which keeps sand out which is a big deal here in Afghanistan. Sand is a real problem out here and it gets everywhere you can imagine and many places you cant! Highly recommend these for desert environments.